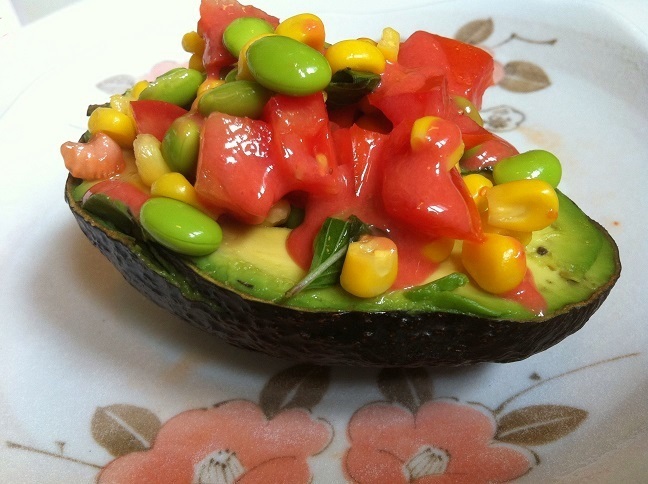 A healthy salad filled with creamy avocado, edamame, sweet corn, basil, and diced tomatoes and drizzled with strawberry balsamic vinaigrette. 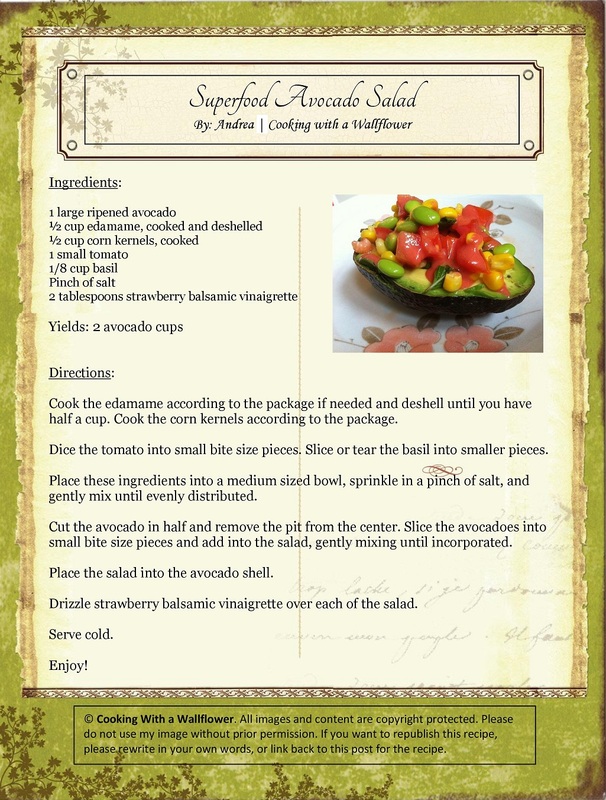 Quick and easy and oh so very delicious, this salad is perfect as a starter to any meal. Since it’s Mother’s Day, we need to make something special. Does this salad look amazing or what? All those pretty colors make me want to eat them. 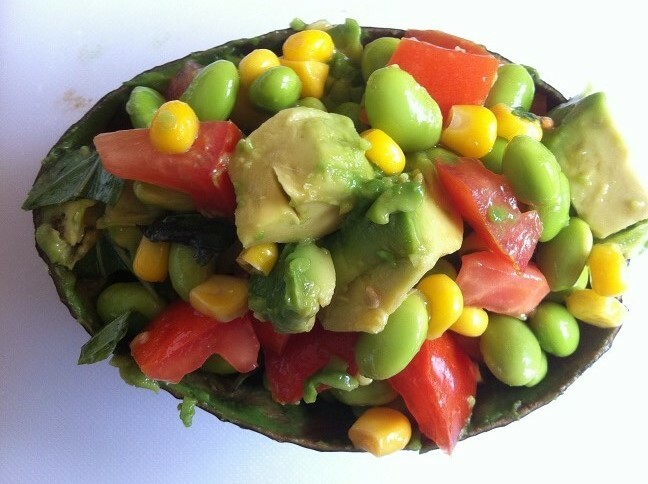 An avocado filled with sweet corn, edamame, tomatoes, and basil in every bite and drizzled with sweet Strawberry Balsamic Vinaigrette. What isn’t there to like? This salad only contains a few ingredients, but it is super healthy since it’s packed with superfoods. What are superfoods? 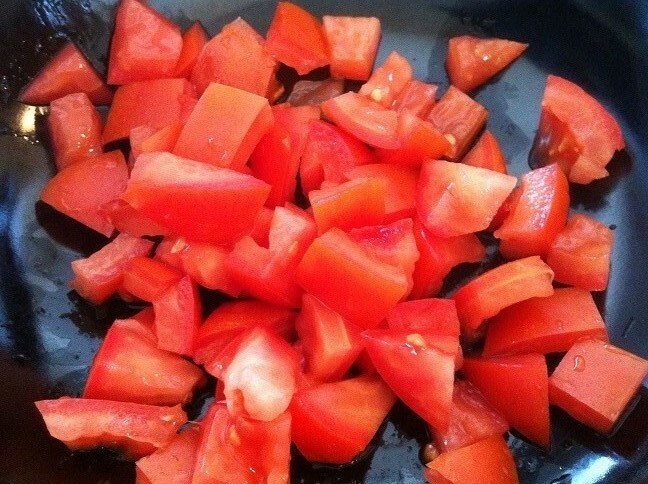 They’re foods that individually contain tons of nutrients and provide lots of health benefits. 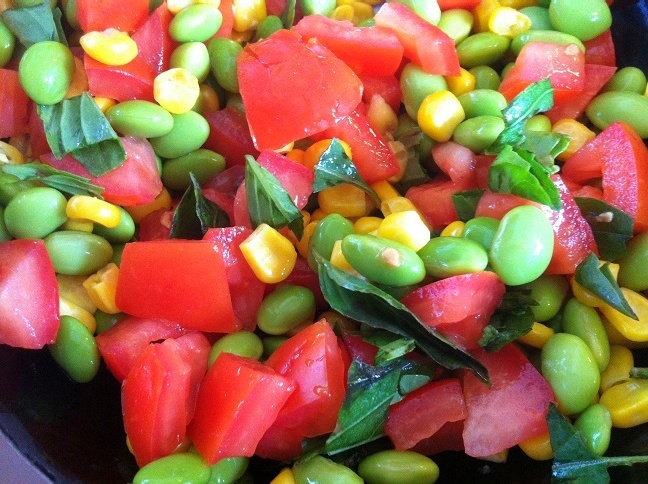 The superfoods that can be found in this salad includes avocado, tomato, corn, and edamame. Yes, all the main ingredients in this salad. They all help provide cardiovascular support, promote bone health, and has anti cancer benefits. Some of these help regulate blood sugar levels and help reduce risk of obesity. With barely any cooking, this salad can be prepared in about 15 minutes. It’s that simple to make. All your really have to do is mix the ingredients together. 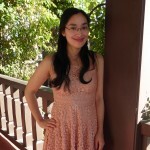 And it’s perfect for special occasions too because of the vibrant colors. It looks fancy but took little time to make. First, cook the corn according to the package. 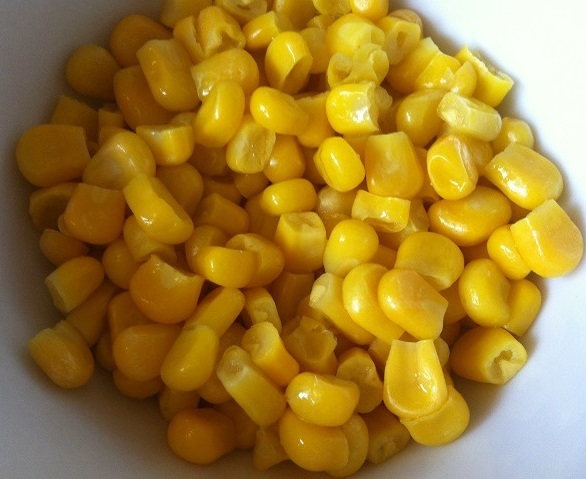 I used frozen corn kernels and all I had to do was heat them up. 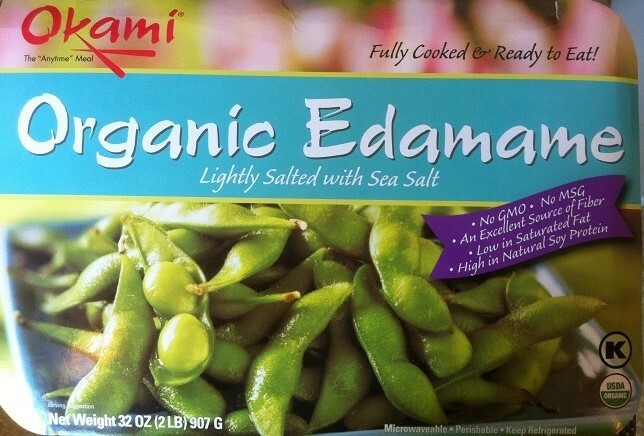 Cook the edamame according to the package then deshell them. I actually bought a huge pack from Costco that’s already precooked so all I had to do was deshell them. I actually thought that was the worst part. 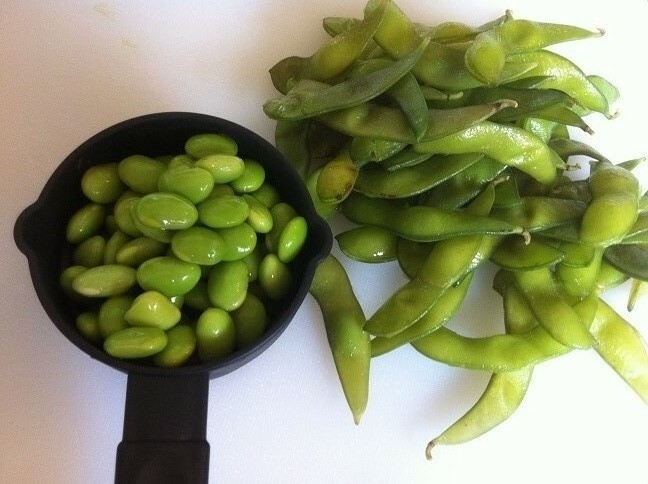 My edamame flew everywhere and I had to scramble around the floor picking up after myself. Dice a small tomato into bite size pieces. Tear up basil into small pieces. 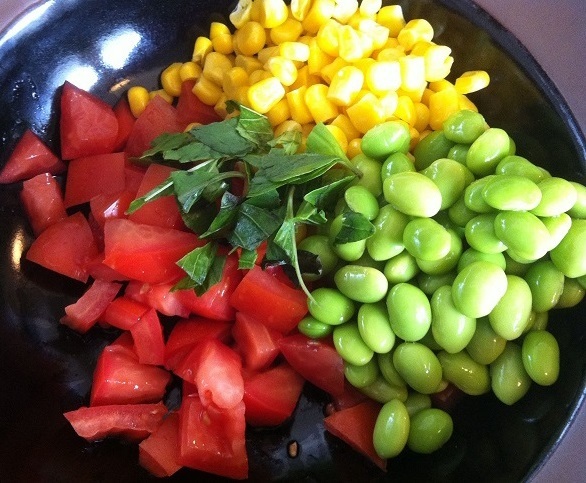 Place all the ingredients into a medium sized bowl. Gently mix the ingredients together. 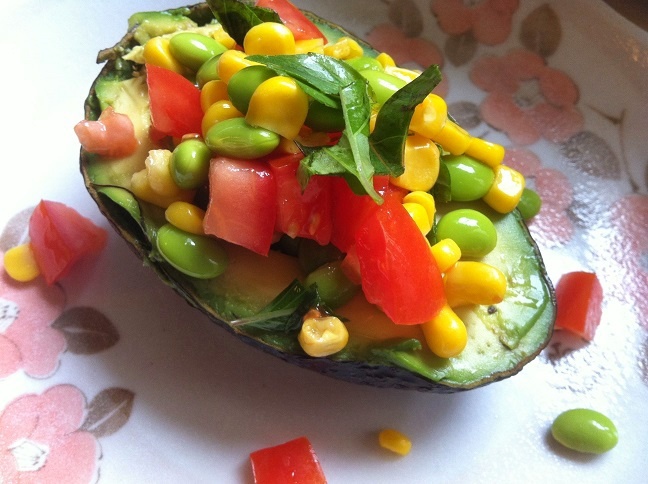 You can simply place the salad into the hollow part of the avocado. Easy, right? 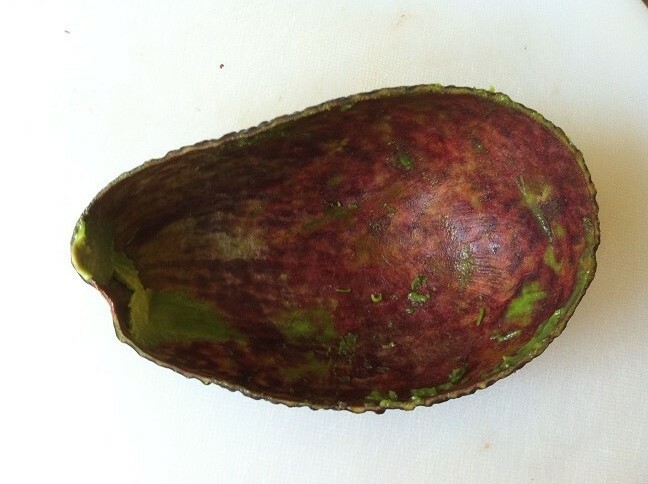 Or you can slice the avocado into bite size pieces and mix them into the salad. 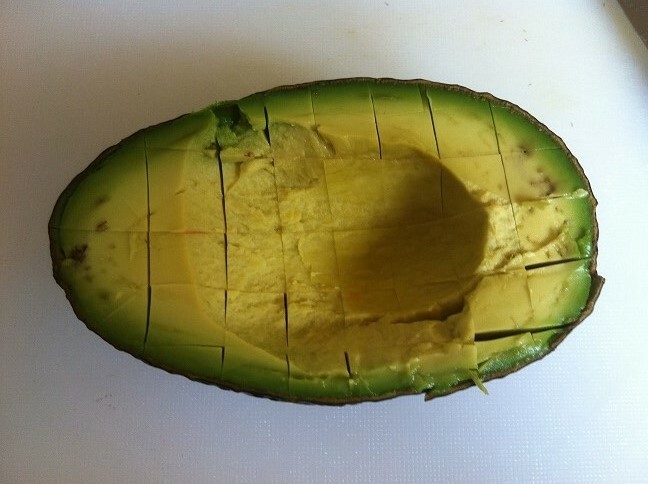 Do this gently so that the avocado doesn’t become smashed. Then place the salad into the empty shell. 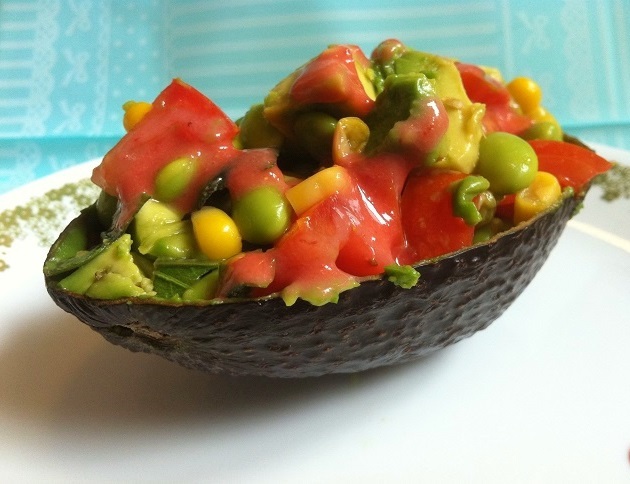 I prefer the second method because the avocado is evenly incorporated in the salad. Plus, you get more room for salad. The first method, I ended up with only avocado at the end. Drizzle Strawberry Balsamic Vinaigrette over the salad. 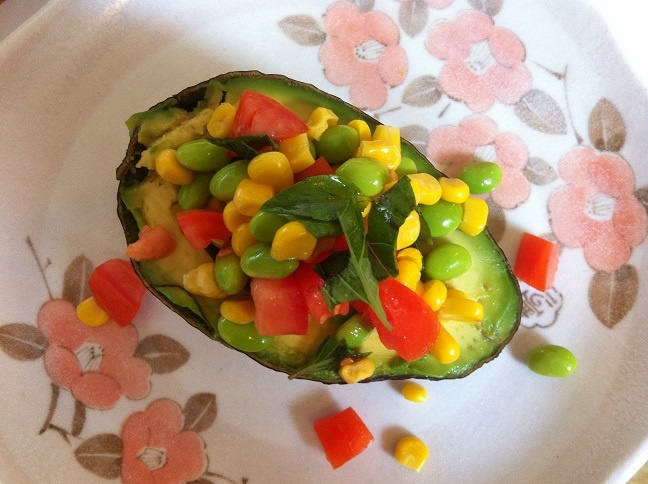 This entry was posted in Appetizers, Asian Inspired, Cheap foods, Gluten Free, Healthy, Quick and Easy, Recipes, Spring Cravings, Summer Cravings, Vegan, Vegetarian and tagged avocado, edamame, Food, healthy, quick and easy, recipes, salad, spring cravings, summer cravings, superfood. Wow! Amazing colors and looking so tempting! Reblogged this on The Bus Stop Lady. Another woman at our table said she used them at least once a week but I’ve never seen them before. I’ll see what our freezer section offers next time I’m downtown but fear nothing so exciting shall materialize – something to savor on holidays! I do that all the time! I go into a store and forget what I’m there to buy!